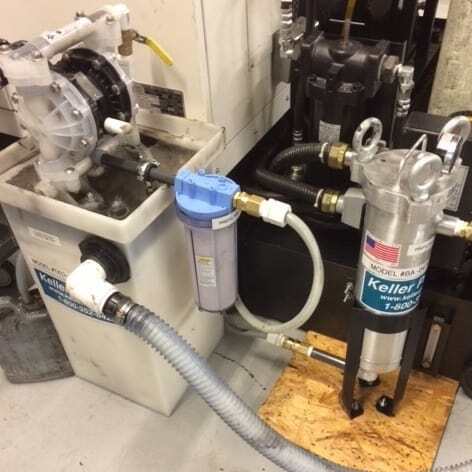 A Keller TKO pump/skimmer rapidly sweeps out tramp oil, filters and aerates the entire sump. TKO-6 mounted on machine tool with CLO-1 “Cling-On” magnetic frame. 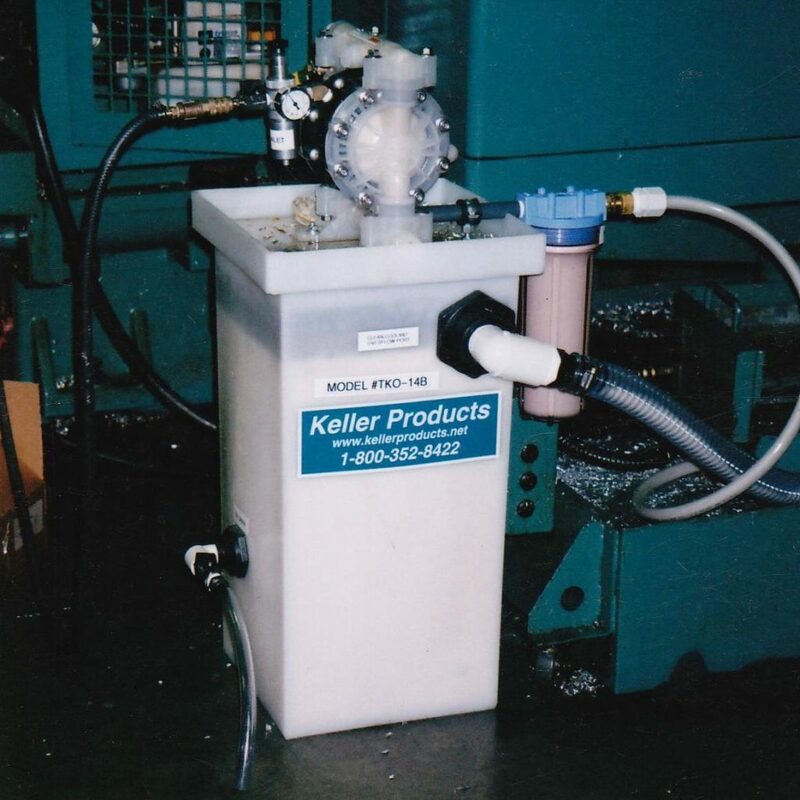 The Keller patented permanent oil separating (coalescing) element provides extraordinary surface area in a small package, providing excellent oil splitting in a compact design. 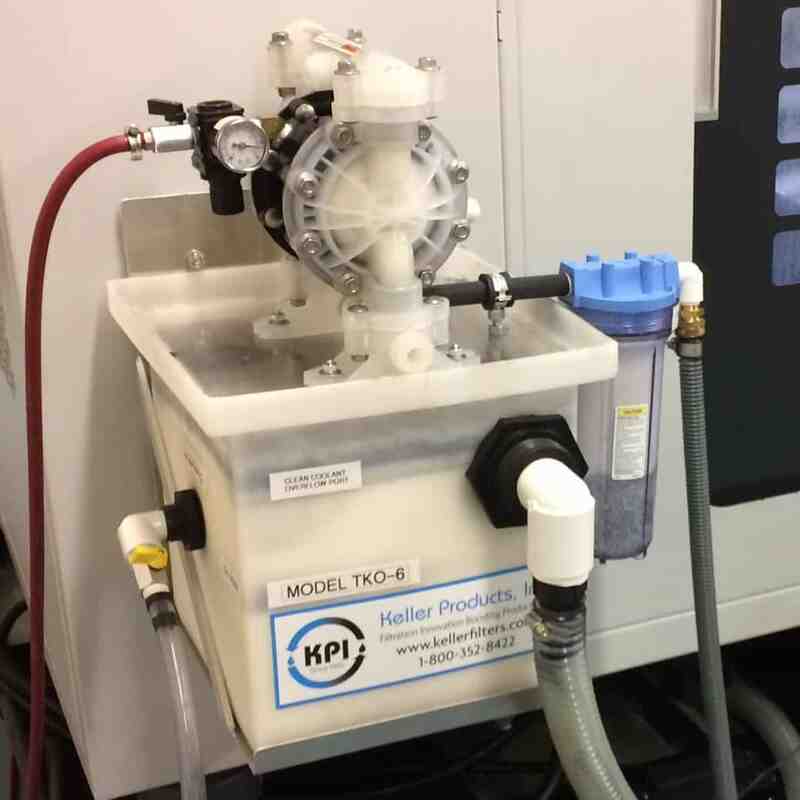 By using only 1/2" air-driven pumps, Keller has eliminated the numerous operating and reliability problems associated with electrical pumps or smaller air diaphragm pumps. A TKO unit ships UPS in one box, and setup time is about 15 minutes. Only a 1/4" compressed air line is required to run the unit. Minimal operator attention is needed. 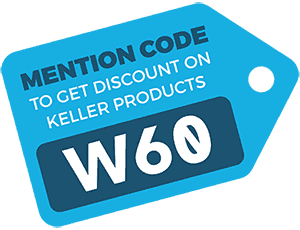 Even including the 1/2" air pump, the unique Keller TKO compact design is 30% to 50% less costly than other comparatively equipped systems. 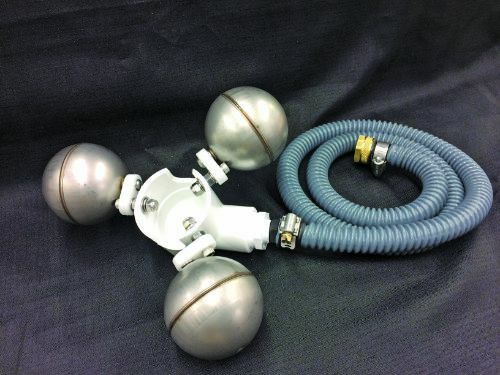 The self-priming air operated pump pulls the tramp oil/coolant mixture from the surface of the sump through the floating inlet device, then through a cartridge filter which removes any chips from the fluid. 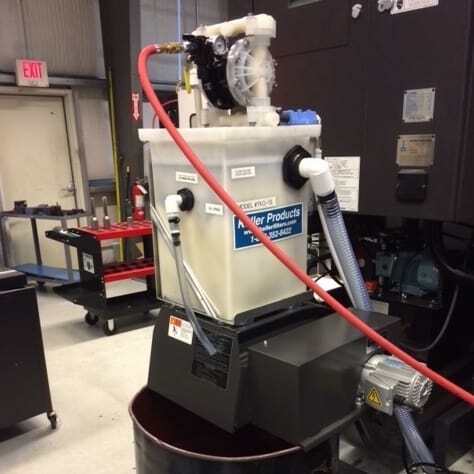 The oil/coolant mixture is then pumped through the patented Keller all-plastic separator element immersed in a separator tank. The cleaned coolant continuously returns to the sump. 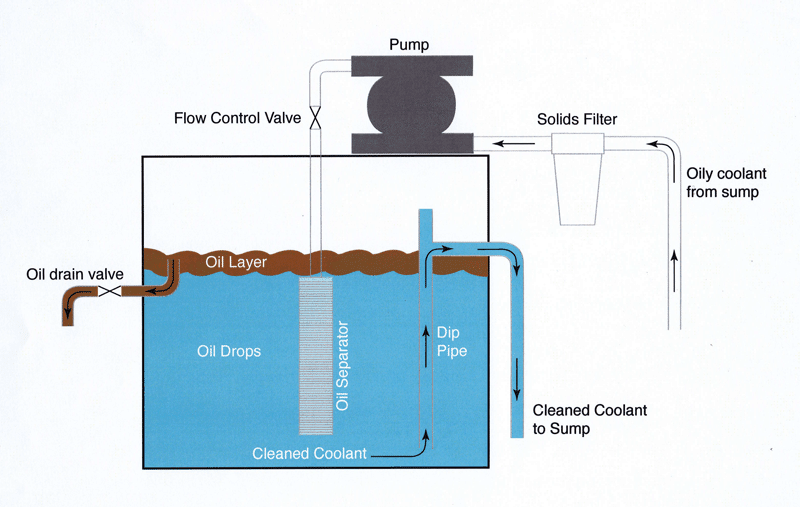 The oil layer collects on the top of the separator tank and is occasionally drained into a waste oil container, simply by opening the oil drain valve. To clean the Keller patented coalescing pack, simply unthread the disc pack from the coupling and wash. Then re-assemble. Payback 3 months (or less)! Three models of TKO Separators are offered, to satisfy any combination of sump size, oil loading, and coolant characteristics. [Selection criteria listed in table below] Each TKO Separator is shipped by UPS complete, ready for setup. The customer supplies only a 1/4″ compressed air line. The unit may be set on the floor adjacent to the sump, or hung on the machine tool using the CLO-1 magnetic frame (see photo). 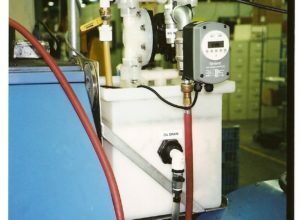 The Keller TBV-1 automatic timer ball valve, mounted on the compressed air supply to a TKO dedicated sump cleaner, will open and close the compressed air supply for a selected duration on a programmable schedule. 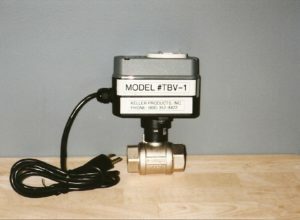 With the TBV-1 valve, the TKO unit can be operated and shut down periodically with no operator attention. The RSM-3 inlet device is the latest generation of oil skimming heads introduced by Keller Products. It incorporates exceptional sweeping capabilities, rugged construction, and adjustable floats to handle the variety of conditions encountered in the field. The #555-05, which also compensates for changes in the level of coolant in the sump, is used when only a narrow access space is available (for example, next to a conveyor). The #555-06, which requires only a 3″ diameter hole in the sump cover, is used when limited access to the sump is available. The #555-06 is clamped to the side of the sump with a holder that easily permits sliding the outlet tubing manually to compensate for changes in the level of the coolant. The most frequently used inlet device, the #555-07 automatically compensates for any change in the level of coolant in the sump. Recently introduced, the #555-17 is used in applications similar to the #555-07. The #555-17 offers a more compact footprint and is able to tolerate a higher concentration of floating solids (for example, when machining aluminum). Please fill out the form below to request an order.